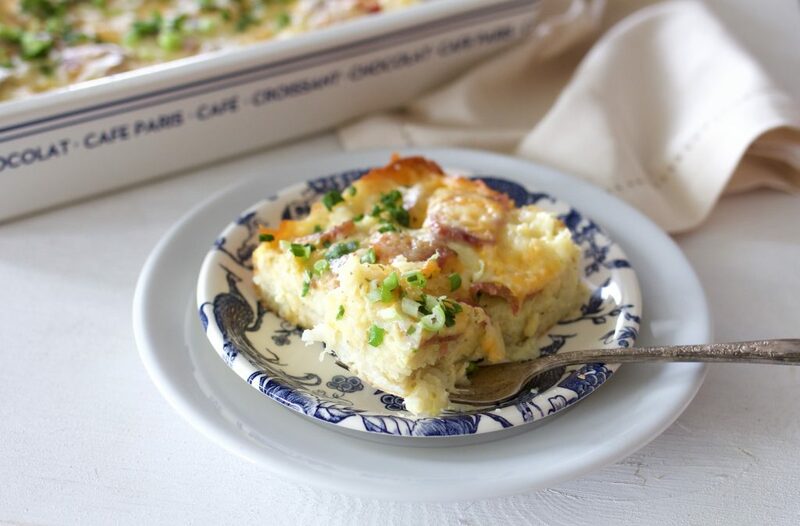 I love a good breakfast casserole! 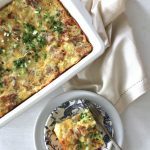 Most breakfast casseroles involve sitting overnight in the fridge, but this recipe for Hashbrown Breakfast Casserole can be baked right away. You’ll love the simplicity of this gluten free recipe and the way you can easily adapt it to your liking. I’ve always been a breakfast lover. Maybe because my mother always insisted on making me breakfast before I headed off to school as a young girl? We were only allowed to eat cereal once a week, also peanut butter and jam sandwiches were few and far between! My mom loved cooking, and hot breakfast was always on the menu at our home growing up! The world has become such a busy place that sitting down to breakfast is something we seldom do anymore. Weekends, especially Sunday are a cooked breakfast day in our home. I love to make biscuits, pancakes and waffles for our family! Hashbrown Breakfast Casserole is a dish I’ve made many times, but never written out the recipe, because it changes almost every time I make it. 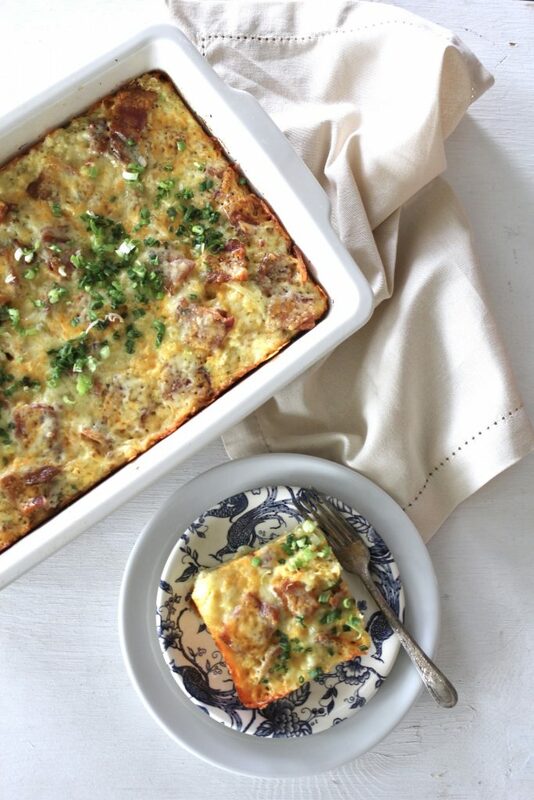 If I have leftover ham, or bacon or sausage, it goes in the Hashbrown Breakfast Casserole. Sometimes, there’s no meat in the house, but it doesn’t stop me from making this dish, I’ll often add a bit more cheese, or change it up and add two or three different types of cheese to make this dish a little more interesting. Cooking gluten free? This dish is perfect for people who have Celiac disease or are sensitive to gluten. I love this dish and everyone I’ve served it to, including teens to elderly people give it two thumbs up! No need to prepare one gluten free dish and one with gluten, the gluten eaters will love this recipe! 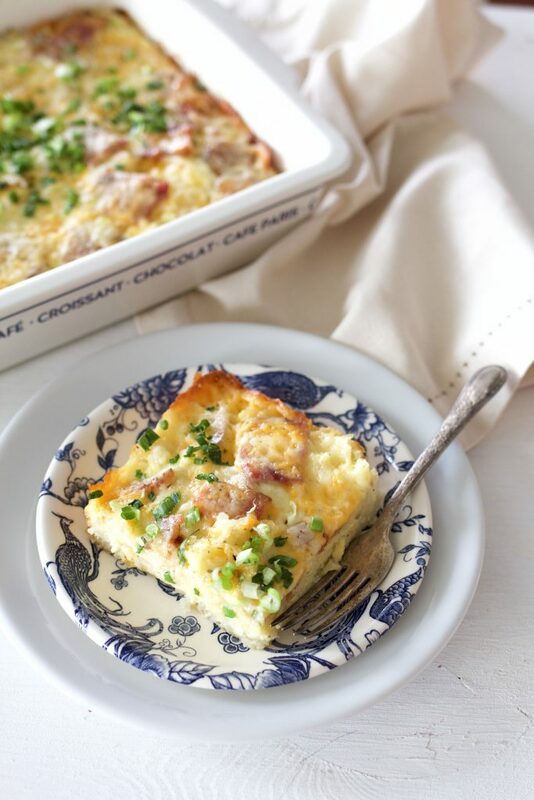 Hashbrown Breakfast Casserole can be made with either fresh grated potatoes or a bag of frozen potatoes, cooked and then placed in the 9×13 pan. I highly recommend cooking the hash browns before adding to the pan. I had to make this once when I was in a hurry and didn’t brown the hash browns first, and the base turned out a bit soggy. I know you’re going to love this recipe for holidays, gatherings or weekends at home when you have a little extra time to make breakfast for your family! Preheat oven to 350 degrees and set rack in center of oven. Turn griddle or stove to medium high heat. Add oil to pan, Cook hash browns until they are golden, seasoning with 1 teaspoon of dried parsley and pepper. Place the cooked hash browns in a lightly greased 9x13 pan. Sprinkle meat on top of hash browns in pan. Blend together eggs, salt, dried mustard and cottage cheese until smooth, about 1 minute. Pour egg mixture over top of meat and hash browns in pan. Sprinkle with grated cheese. Cover with a sheet of foil. Bake covered for 45 minutes covered, remove for and bake for an additional 5-8 minutes uncovered. Remove from oven when eggs are set and cheese is golden. Let sit for 10 minutes before cutting and sprinkle with additional chopped green onions. -When using fresh or frozen potatoes, place a couple tablespoons of oil on a hot griddle and cook grated potatoes until they are browned, flip once and let cook on opposite side. I usually cook on medium high heat. -Make sure, if you are cooking gluten free that the package of frozen potatoes does not contain gluten! Most do not, but better safe than sorry. I had this casserole at a crafting party recently and fell in love with it. This is the perfect thing I can make ahead for my grandson to eat on his way to school in the car. The only thing was they did them in individual 4 oz containers and I’m not sure how long to cook them like that. Any suggestions would be helpful. I suggest cooking it all in one pan, then individually wrapping each square and heating one up each day. If you decide to cook them in individual containers, take them out of the oven when the eggs set. Similar to the consistency of a quiche. Hi! Can you make this the night before and keep it refrigerated until morning? Yes you can, but you don’t have to! That’s the beauty of this recipe- you can make and bake it it you’re in a time crunch, or have it waiting in the fridge to just heat and serve in the morning. Let me know how you like this casserole! Do you think that this would be ok without the cottage cheese or? If you are not a cottage cheese fan, I don’t think this recipe will bother you. The cottage cheese is blended in with the eggs for a more creamy consistency. The casserole also has cheddar cheese (or another favorite cheese) on top. I hope you enjoy this quick recipe that feeds a crowd! Could I use ricotta cheese instead of cottage cheese? Looking forward to making this soon! Yes, you can substitute ricotta for the cottage cheese. 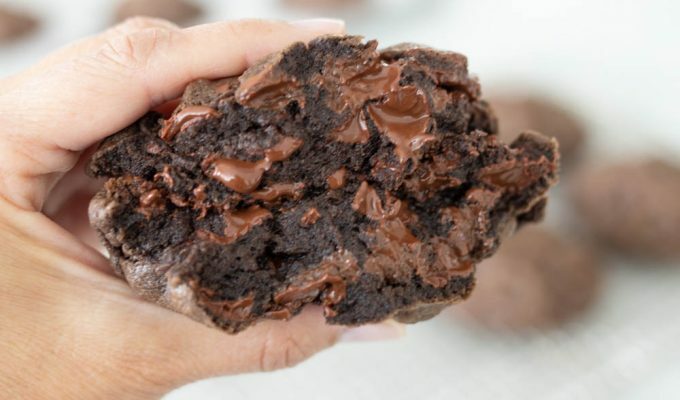 this recipe is so easy and a hit with the whole family. Sometimes I make two at a time. One to pop in the oven, and one to cover and freeze for an easy breakfast on a busy day. This recipe tastes as good as it looks! Let me know how you like it. Do you add some of the green onions with the egg mixture? Yes, half the green onions in with the egg mixture and the rest on top as a garnish. Thanks for catching that – I just clarified the post. How did you like the recipe? I made this for my family and they loved it! I would like to make this for a family gathering of 50 people. Could I cook it the night before and reheat in the oven the next morning? If so, what temp. and for how long? Hi Jennifer, yes you can cook it the night before and follow the recipe for baking. To reheat, I would set it in the oven at 350 and bake until the cheese is melted on top. Thanks for asking!